Between 2008 and 2012, the analogue TV signal will be switched off in the UK, meaning the country will have to be 100% digital. Digital TV can be sent through an aerial, satellite, cable or phone line, and to watch it you need a set-top box or a built-in decoder in your TV set. As well as extra channels, digital also provides improved quality, electronic programme guides and interactive features via the red button, like voting or extra coverage such as Ashes highlights. While analogue signals work by transmitting sounds and pictures as continuously varying waves, digital information is sent as compressed computerised pulses of information, coded as 1s and 0s. Because these signals take up much less space than analogue, more channels can be squeezed into the same airwaves. High definition television, or HDTV, is a new format for watching programmes, offering sharper, clearer and brighter pictures and better sound. You need an HD-ready TV and an HD set-top box or decoder to receive the programmes, which are sent through digital signals. Televisions are considered HD-ready if the screen has enough pixels to display a high definition picture and must be capable of displaying pictures with either 720 or 1080 vertical lines. The programmes themselves must be made and transmitted in HD. The BBC is running free trial HD broadcasts, and Sky and Telewest are offering a commercial HD service. HD films are also available, but in two different formats - Blu-ray and HD-DVD. Personal video recorders (PVRs) record digital television straight onto computer-like hard drives. They let you pause, rewind and replay action on screen while you are recording a programme - allowing for time-shift viewing of live TV. PVRs have built-in programme guides, making it easier to choose what to record. Some models let you tell them to always record your favourite soap, or tape all programmes on a specific subject. 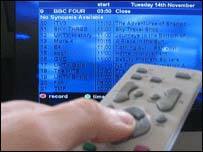 Most PVRs are combined with a digital TV service - such as Sky or Freeview. "On demand" means being able to throw away the TV schedule and watch what you want, when you want. 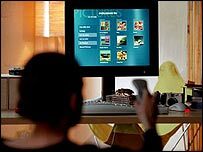 Dedicated services - such as HomeChoice and BT Vision in the UK - send shows and films over a broadband connection to your TV via a set-top box. Or viewers can watch at leisure on a computer, with many US networks already offering hit shows online and UK broadcasters fast catching up. The missing link with this option is the device that connects or combines the computer and the TV. Connecting your TV to your computer, or just having one machine that does both things, is expected to be big. This will open up a huge library of video from the internet to watch on your TV as well as using the computer's memory as a PVR. There is some way to go before the technology and usability are slick enough to make it truly viable, but Microsoft's Media Centre has made a start. Apple will bring out its iTV, doing a similar thing, early next year. And games consoles such as the Xbox 360 let you download shows to watch on TV. A device called the Slingbox could really shake things up, beaming your home TV signal to any computer wherever you are in the world. Mobile phones can now be used to watch television on the move. High-speed connections on the 3G network enable pockets of information to be watched on mobiles, but this bears a heavy load on network. Competing technologies (DAB-IP and DVb-H) are being trialled by phone manufactures to let more people watch the same shows simultaneously. All mobile operators offer some sort of video service, with some now able to receive BBC One and ITV1 live, while others allow you to watch a wide range of "made-for-mobile" channels or download clips. As well as mobile phones, watching shows or video podcasts on iPods and other MP3 players is becoming increasingly popular.